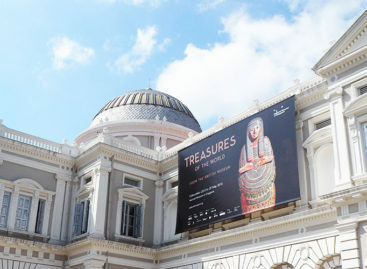 The Peranakan Museum showcases the world’s largest collection of Peranakan art, clothing, furniture and artefacts and is the best place to discover vibrant Peranakan culture. Converted from one of Singapore’s oldest elementary schools (Tao Nan Chinese School) that was built in 1912, the museum building itself is an official National Monument. In 2005, the original facade of this neoclassical 3-storey school was refurbished and painted with gorgeous pastel colours. The term “Peranakan” refers to people of mixed origins, namely the children of immigrants who came to the Malay archipelago and intermarried with locals. As the first shipping port in the southern part of the Strait of Malacca, Singapore became a major crossroad for trade since the 13th century. Travellers came from across the globe to do business here and many of these Chinese, Indian, Arab and European settlers married local Malay women. These couples raised “Peranakan” children who observed a mix of their parents’ eating, dressing, artistic and religious customs, and as a result, created a culture that is unique to this region of the world. A great introduction to what defines a “Peranakan” person. 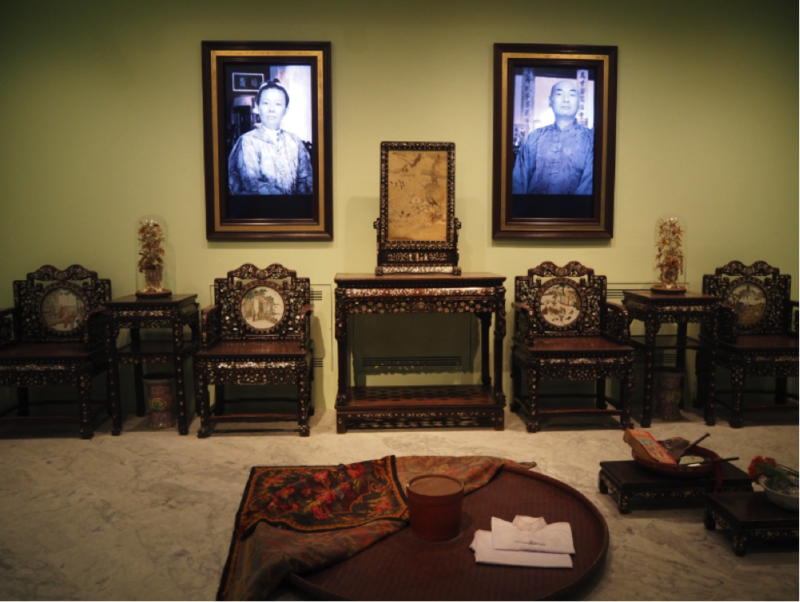 This gallery features portraits of Peranakans and their thoughts on what it means to be a Peranakan. Being the product of inter-ethnic marriages, Peranakans are famous for their vibrant 12-day wedding customs. You will see beaded embroidered outfits (a different one is worn by every member of the wedding procession), influenced by Chinese and Malay attire. Their jewellery is inspired by Indian tastes. Exhibits here also show the traditional Peranakan “coming of age” ceremony and gift exchange ceremony. Ever wondered what inspired the beautiful patterned outfits worn by Singapore Airlines stewardesses? Here, you’ll see how the silhouette of the Peranakan kebaya traditional outfit changed over time to embrace women’s figures. You can buy your own traditional wear at the True Blue Shoppe located next to the museum’s entrance. Peranakans are an eclectic mix of people with varied religious beliefs. You will see a video of a Catholic Mass delivered in Malay, a language more commonly associated with Islam, as well as an altar table used for Chinese ancestral rituals, and displays of animistic folk superstitions. 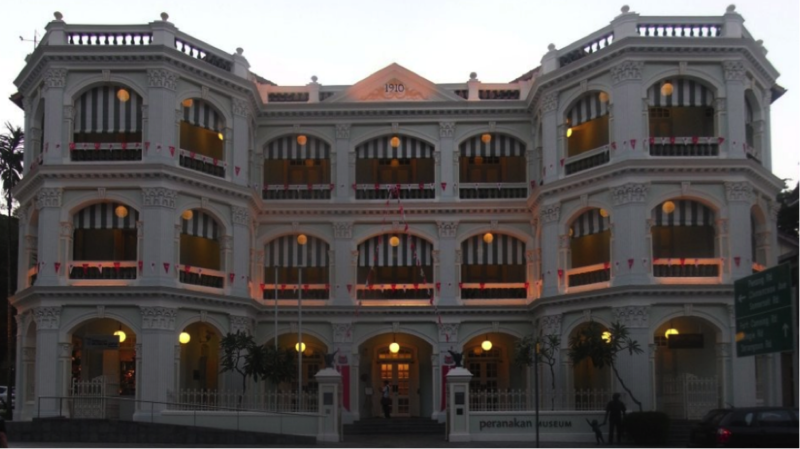 Find out which famous politicians and philanthropic leaders in Singapore have Peranakan heritage, and how they played a prominent role in building the nation. The top floor gallery is dedicated to Peranakan dining customs and delicious Nyonya cuisine, which is distinctive for its blend of Chinese, Malay, Indian, Thai, European and Indonesian ingredients and cooking methods. WATCH: Catch the museum’s interactive exhibits to enhance your understanding of Peranakan culture. At “Weddings”, watch a mother and father discuss their daughter’s wedding ceremony preparations. At “Food and Feasting”, you will see a Peranakan kitchen come to life every hour on the hour. PLAY: There are “games” to play! 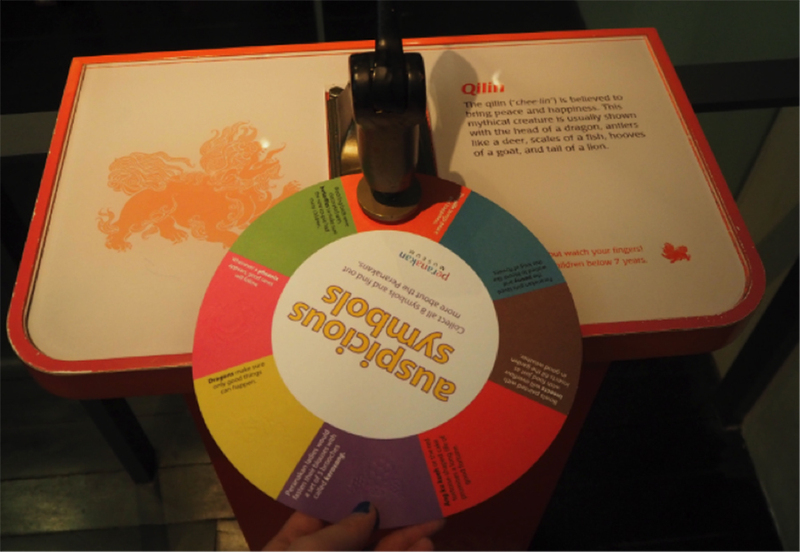 Pick up an activity sheet at the reception and look out for the embossing tools throughout the museum to collect stamps of auspicious Peranakan symbols. You can also answer retro telephones to listen in on re-enacted conversations between Peranakan families. If you enjoy spending your days discovering bits of Singapore’s culture, explore Kampong Glam and Joo Chiat with us! PARTY: Explore and party after hours during festivals and special events. This year the Peranakan Museum hosted their first Armenian Street Party featuring live drama and musical performances, and every year this is also a go-to spot during the Singapore Night Festival. After touring the museum, try some authentic Peranakan food yourself at the museum’s in-house cafe True Blue Pantry which sells floral teas and Peranakan kueh (cake). For a full Peranakan meal, head to the True Blue Cuisine restaurant next door, which boasts its own private collection of Peranakan pictures and antiques. Must-tries include the ayam buak keluak (black nut chicken) and jantong pisang (a spicy banana salad with cucumber salad). Guided tours: Guided tours are available in English, Mandarin, Japanese and French.